March’s competition was the annual McCoubrey Stout Competition held during BURP’s monthly meeting. This was the first competition using the 2015 BJCP Guidelines and had an impressive 20 total entries! The categories and number of entries were as follows: 15B (Irish Stout- 5 entries), 15C (Irish Extra Stout-1 entry), 16A (Sweet Stout- 3 entries), 16B (Oatmeal Stout- 3 entries), 16C (Tropical Stout- no entries), 16D (Foreign Extra Stout-1 entry), 20B (American Stout- 3 entries), and 20C (Imperial Stout- 4 entries). Many thanks to the judges: Wendy Aaronson, Mark Hogenmiller, Trish Koch, Steve Marler, Craig McRobbie, Dave Pyle, Matt Pyle, and Wendy Schmidt for all their hard work in evaluating the entries. 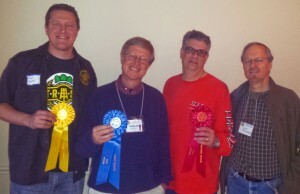 After the judging dust settled, Charles Thrower took first place with his Irish stout called “Blarney Stout”, while Dan Rozman and Lon Holland took second place with their Irish extra stout called “Roast Resplendence”, and Mike Evans took third with his sweet stout appropriately called “And in 3rd Place”. Lastly, with a hearty handshake from the Ministers of Culture, Matt Pyle received an honorable mention for his oatmeal stout called “Stoutyoats”. Check out Charles’s award-winning Irish stout recipe below. Mash grains at 150° F for 90 minutes. Mashout at 170° F for 10 minutes. Boil time – 90 minutes.